Life can get pretty rough sometimes. It’s so long that rough patches are guaranteed to happen. The question is what do you do when those rough patches form? Do you hide and wonder why this happened to you? Do you give up and admit at how pointless it all is? Or do you look around the corner for something better, something that will get you out of the tough times? Do you carry on through the muck and find the light at the end of the tunnel? The pop band fun. go through this whole range of questioning on the third single off their 2012 album “Some Nights”, aptly named “Carry On”. 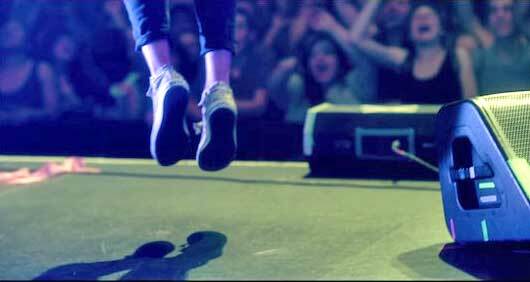 Nate Ruess’s custom chucks before the show. The lyrics tell the story of a young man waking up to find his lover having an emotional crisis with a half drunken bottle of wine in her hand, and her face hidden behind a curtain. She tells him that she’s come to the realization that they are not special people, they’re just normal and their lives don’t matter. He reassures her that that’s always been the case, and there is no reason to get down about it. When life gets you down you have got to carry on and find solace on the other side. The man then says how he and his friends think about how everyone they know will one day die, but still he believes that he can cheat death as payback for all the times he’s been cheated on. This hope keeps him going, and helps him carry on. 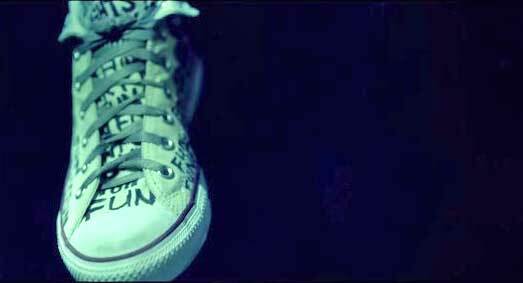 In the music video, the lead singer of fun., Nate Ruess, is wearing a customized pair of all white chucks. They are adorned with scribbles of lyrics and songs. The video cuts back and forth between the band roaming through the streets of New York, to playing in front of a sold out theatre. It show the things that the singer has to live for. His friends and fans are what keep him carrying on. Closing out the show with one last jump. 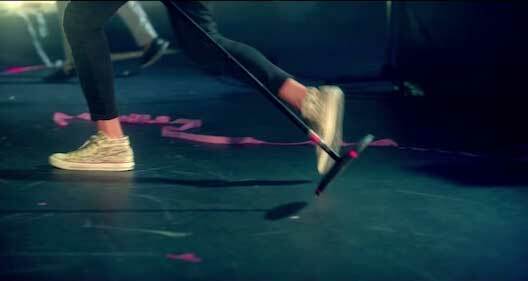 Get yourself a pair of chucks to perform in by clicking on the links below.